Alternatively, you can purchase the album through a variety of different services here. What do you think of it? Let us know in the comments. After an Instagram tease this morning, Radiohead released a new music video for a song called “Daydreaming” moments ago. The video was directed by Paul Thomas Anderson and features Thom Yorke wandering around, entering and exiting different environments through doors. It was also announced that the still unnamed new album, their 9th, will be released on May 8th at 7 PM BST digitally. You may also purchase the single here or here. After “deleting their entire presence” off of the internet yesterday, Radiohead released two teaser video on their Instagram earlier today. This all led up to a full-length music video for a new song called “Burn the Witch”, directed by Chris Hopewell, who also directed the “There There” video back in the day. Radiohead pays tribute to Scott Johnson. Photo by @fittr_happier. Radiohead returned to the stage last night for the first time since the tragic death of drum tech, Scott Johnson. If you’ll recall, Johnson was killed during a stage collapse last month in Toronto which forced the band to delay the tour. 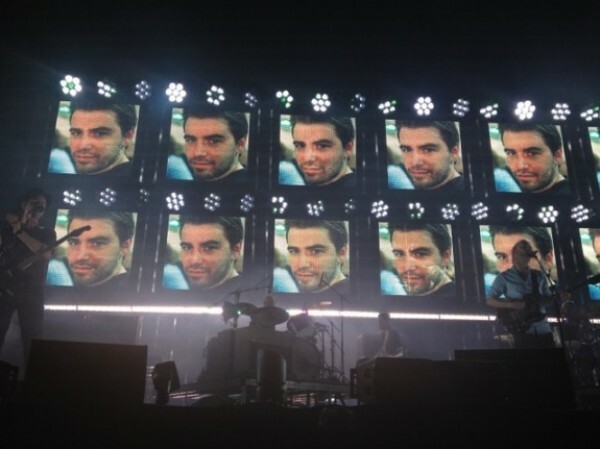 For the third encore, Thom Yorke thanked the crew and dedicated “Reckoner” to Johnson, whose picture was displayed behind the band during the performance. The full setlist is below. The band return to Les Arena tonight for their second show.